Mahasattva accommodates 8 guests in 4 spacious queen cabins, ALL en-suite with stall showers and electric toilets with bidets. 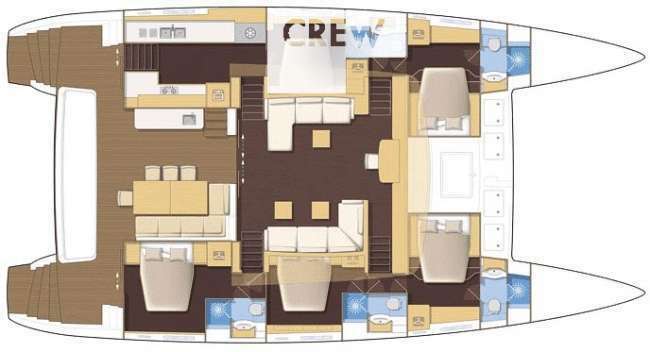 1 forepeak single berth cabin, with A/C and with tiny head, deck access only. where his father taught him how to windsurf when he was 7 years old. Driving boats soon became one of his biggest pleasures, because it combines sea, machines, and people. Since 2010 he is working in yacht industry, skippering summers in Mediterranean and winters in the Caribbean. although kindness, social skills, and discretion are some of his good assets as well. His professional background and knowledge of the area assure safe and fun cruising on our mighty Mahasattva. Ian is a lifelong sailor and traveler. Moving to Ireland at a young age Ian was introduced to sailing and racing and moving to San Francisco allowed him to hone his sailing in a very demanding environment. Being on boats has made him very at home on the water and between his Irish upbringing and service industry background in bartending make him a very welcoming and accommodating presence on any sail. Ian has sailed Ireland, San Francisco, France, Spain, Portugal, and in the Caribbean. Ian ’s professional conduct, as well as his enthusiastic love of the ocean and nature, brings a wonderful joyful perspective to the charters. Chef Lindsey Chirichiello hails from New England and a long line of chefs. Following in her fathers footprints, she found herself in the restaurant industry at a very young age. Always mesmerized with the tasty creations flowing out of the New England kitchens she worked in, she decided to peruse her passion for the culinary arts. She immersed herself in culinary courses and the bustling food scene. In an effort to keep her passion for travel stoked as well, she set off in the yachting industry roughly eight years ago. From the Eastern Seaboard of the US, France to Spain, Italy to Turkey, Croatia and many other stops in between, she has honed her skills in several different styles of cuisine. On crossing the Atlantic she let her creative side flow with inspirations from the Caribbean and South America. She takes much pride in tantalizing your taste-buds, but also in constructing creative cocktails, and cultivating a vacation for the memory books! Gasper was professional, flexible, catered to our every whim, and set a high standard for the crew. The crew were first class and good company as well. They respected our privacy but we enjoyed their company so much that we included them in many of our discussions. This was an incredible boat. Brand new and impeccably maintained. The captain adjusted the itinerary to optimize it for our group. He was extraordinarily sensitive to our desires and fulfilled them totlally. There were so many amenities that we never used some of them. The food was superb and perfectly presented! I gained 4 pounds despite all the exercise, but it was worth it. The chef accommodated my gluten-free wife without discomforting the rest of us. Best vacation I've had in every respect.